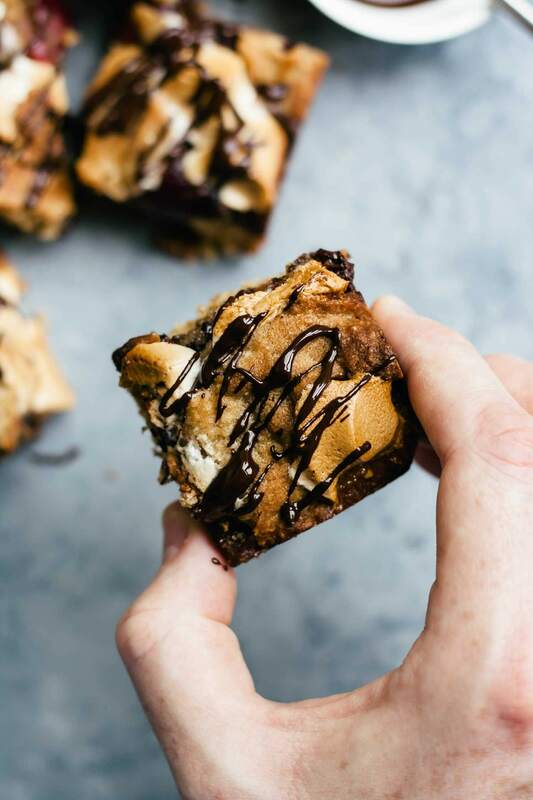 But this isn’t just any old cookie bar, nope, these are made with s’mores-esque cookie dough that is just downright addictive. It’s a pretty basic cookie dough recipe with graham cracker crumbs mixed in. Being from the UK, I used digestive biscuits instead of graham crackers – I think that’s a pretty good substitution, as far as I’m aware. It certainly tasted amazing anyway! I also added some ground up almonds to my cookie dough because almonds and cherries are of course best friends. That’s totally optional though, just replace with more digestives/graham crackers if you don’t want to use the almonds. 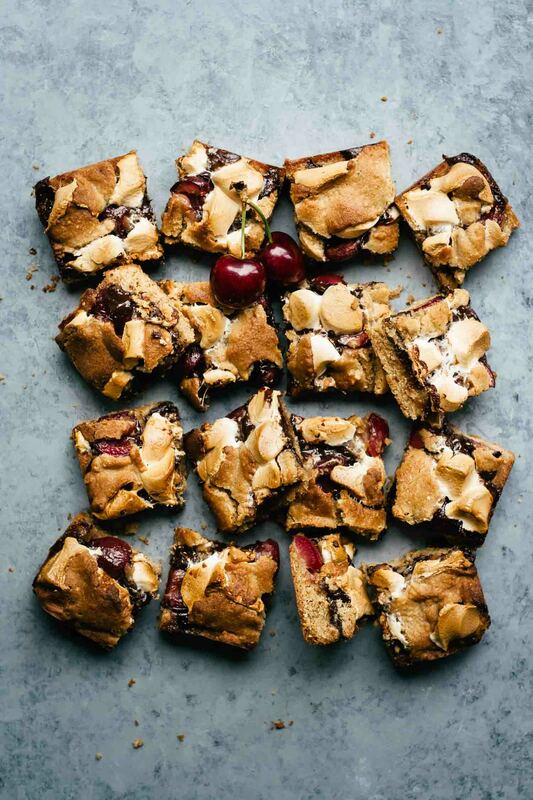 These dark chocolate cherry s’mores bars are seriously easy to make! I whipped up the cookie dough in my stand mixer (though you could use a hand mixer) and then it’s as simple as layering all the good stuff up on top and baking it to golden, melty perfection. I would definitely advise letting these cool in the tin before slicing them but you must definitely eat at least one (or three) whilst they’re not yet fully set, but the tops are a little crisp. These are some of life’s simple pleasures, enjoy them! And whilst not totally necessary, a drizzle of melted chocolate on the top just takes these over the edge! Preheat oven to 180C/350F. 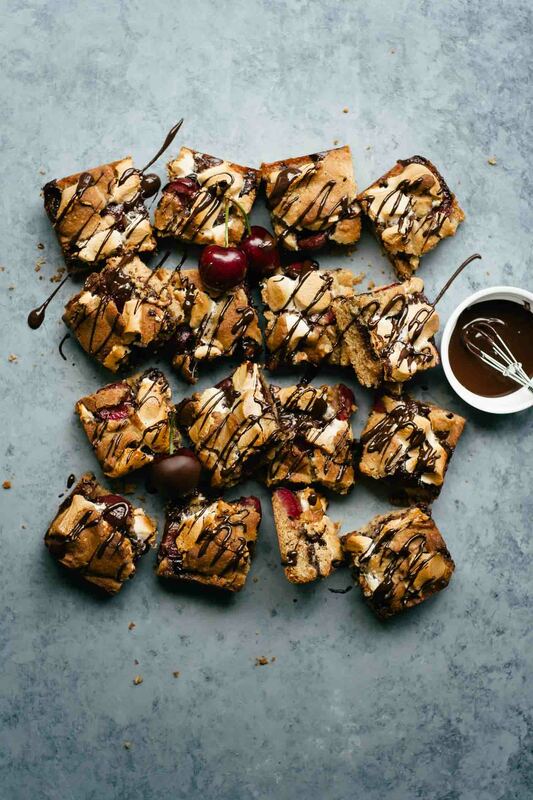 Line a 9"x9" baking pan with baking parchment - leave enough overhang that you will be able use the paper to pull the s'mores bars out of the pan later. In a stand mixer using the paddle attachment (or using a hand mixer) cream together the butter and sugar until pale and fluffy. Beat in the egg, vanilla extract and almond extract (if using) until well combined, pale and creamy. Slowly mix in the flour, digestive or graham cracker crumbs, almonds, baking powder and salt until a dough is formed and no streaks of flour remain. Press 3/4 of the cookie dough into the base of the prepared baking pan. Set aside the remaining dough until later. 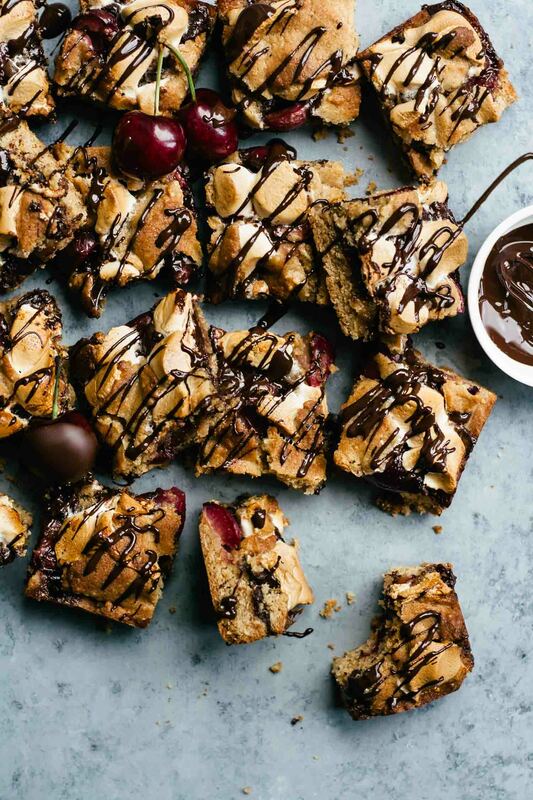 Sprinkle the chocolate chips, cherries and then the marshmallows evenly over the top of the dough. Finish by dotting the remaining cookie dough over the top. This doesn't have to be neat! You won't be able to cover all of the toppings. Bake for 20-25 minutes until golden on top. Leave to cool before cutting into 16 bars. If you don't have any almonds, just replace with more digestive biscuits/graham crackers. When I made these I used regular marshmallows and cut them into 4 pieces each - mini marshmallows would be far more convenient but use what you have! I use a fan-assisted oven - I baked these for both 20 minutes and 25 minutes. My preference was to bake them for 20 minutes, which resulted in a more squidgy base. Looks delicious. 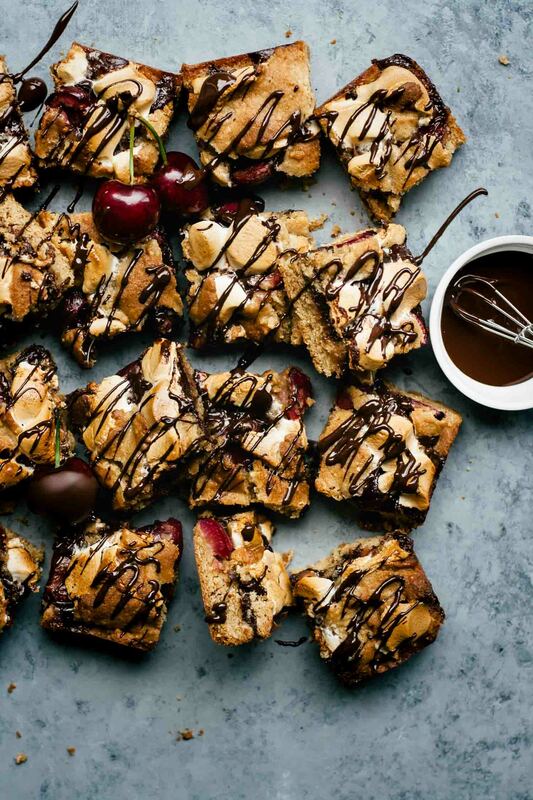 What does s’mores mean and are they fresh cherries? Those are so delicious, Sasha! First time I had s’mores was in Canada, here is so popular as well! But I love love your version, with fresh cherries! Thank you Nicoletta! The cherries are so good! I think the phrase “I can’t even” was made for recipes like this. O.M.G. What. This looks beyond delicious. 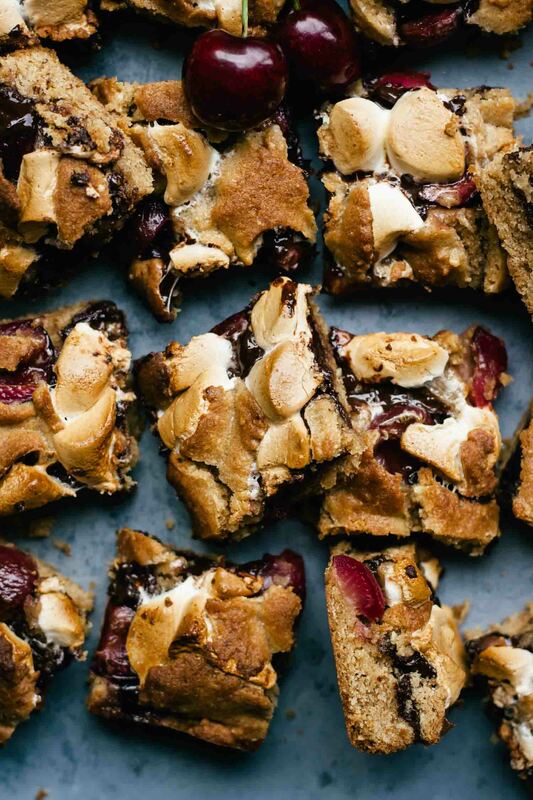 I just bought some cherries yesterday and now I can’t wait to use them in these brownies!